As noted in my last review of a video decor DVD, although the concept (and commercially available) existed in the age of VHS, it wasn’t until DVD technology entered the picture that Halloween video decor really took off. 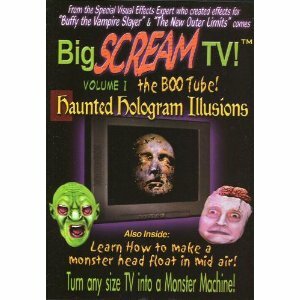 One of the biggest and most influential titles to take advantage of the technology was the Big Scream TV series by Lightform Productions. Choosing the “untame” option starts a fourteen minute and thirty-three second long video of numerous spooky faces. The faces, realized using a combination of makeup and computer generated effects, pop up onscreen for a few seconds to either growl, laugh menacingly or make some comments before vanishing. The transitions are very well done are aren’t just simple fade ins/outs. For example, the mouth monster shown on the cover is spat out and gobbled up by a giant disembodied mouth and demons appear and disappear in explosions of flame. The CGI effects also add extra touches to the fiendish faces. Frankenstein’s monster shoots sparks from his electrodes, a three-eyed monster wiggles its ears and shoots steam from his nose and lots of other neat little touches that I won’t spoil. Although there is some pretty creepy stuff here, it should be noted that several monsters ham it up for their performances and tell corny jokes. Also, despite the “Untame” name that implies use for teenagers and adults, several monsters makes references to children and candy, for reasons that will become clear in a bit. In a nice touch, the track loops automatically and each face has its own chapter stop (for a total of thirty). Selecting the “Tame” plays most of the same material from the “Untame” loop. In fact, the only difference is that the demons, rotting corpse, mouth monster and exposed brain guy scenes have been removed, making the running time only seven minutes and 38 seconds before it automatically loops. It also cuts the chapter stops down to fourteen! Don’t be fooled, though. There’s still some material that will scare kids. Although I’m sure some of the jokes (especially the mummy that injures itself) will help them cope. Selecting the “Tips” option will play a four minute video about the basic set-up, how to use the DVD in displays and decorating suggestions. There are a lot of great tips here, like how to adjust brightness and contrast to reduce light from TV (in order to hide the fact that a screen is being used). There’s also an explanation of using the DVD to create an amazing Pepper’s Ghost effect, which is clearly explained in simple terms and is actually very easy to set up using Plexiglass and household items. In a nice turn of events, the thinnest and cheapest type of Plexiglass is actually the type that works best for the effect! But even if you aren’t able to do that effect, you can still play it on a TV with decorations around it (I recommend putting a frame around the screen) or put it in a darkened window. If you have to go that route, might I suggest putting in a dark room that people can’t enter, thanks to the open doorway being blocked off? You can use stacked boxes, fake nailed-up boards or warning tape to both keep people from getting closer and to add to the effect. The success of The Boo Tube led to two more installments in the series, Funny Bones and Crystal Ball. Lightform Productions has also gone on to release a how-to DVD called Xtreme Haunted Home Make-Over, along with more traditional video decor products like Halloween Scarols and Terror Eyes. I strongly suspect that the success of these titles is why several cheap video decor DVDs started flooding the market in the following years. Special thanks to Lightform Productions for the review copy!